There's something pretty special about Narwhals. They're like the unicorn of the sea! But you don't have to visit the ocean to see a narwhal. You can take one home to have for your very own! 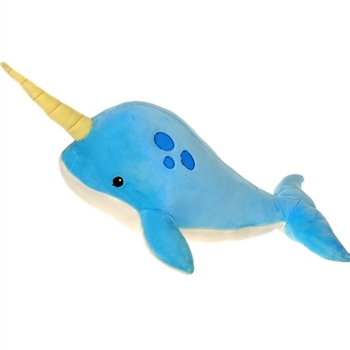 The Comfies Large Narwhal Stuffed Animal by Fiesta would get along with you just swimmingly. Measuring at twenty-two inches in length, this large narwhal stuffed animal is the perfect size to wrap your arms around in a big 'ol hug. When it comes to stuffed animals, you really can't beat this large narwhal plush toy. With its soft, durable plush, bright blue coloring, and impressive horn, it's sure to be an eye-catcher. You probably won't be able to resist the cuddles either. Your friends are going to be really impressed by your fluffy aquatic cuddle buddy too. Just wait and see! It won't be too long before they start asking to get a Comfies Large Narwhal Stuffed Animal by Fiesta too. But don't wait to follow the crowd; be a trend-setter with a large narwhal stuffed animal. It's hard enough to resist the cuteness, the cuddly-ness, and the uniqueness, and at such an affordable price, why should you? What are waiting for? Order yours today! For over 40 years, Fiesta Toy has been one of the world leaders and innovators in stuffed animals and plush toys. Their wide assortment of traditional and unique stuffed animals inspires creativity and encourages imaginative play. Fantastic products like this large narwhal stuffed animal allow children to share in the magic of the animal kingdom and learn more about the fascinating creatures that inhabit and share our planet. The Comfies Large Narwhal Stuffed Animal by Fiesta is made with all new, child safe materials and meets or exceeds all U.S. safety standards. Recommended for ages three and up, we suggest surface washing for this large narwhal plush toy.